If I am stressed, I bake. If I am angry, I bake. If I am confused, I bake. If I am anxious, I bake. If I am happy, I bake. That last one doesn't call for therapy, but still, I bake. Usually I bake a lot of cookies. There is something so soothing about creaming butter and sugar and putting tray after tray in the oven. It requires almost no thought but the repetition is calming. However, if I am having a very bad day I bake bread. Because ultimately there is no better way to get your frustrations out than to violently knead bread dough. You can punch it and mash it and you can even name it if you are upset with a specific person. Then once you have gotten all your aggressive tendencies out you return to the calm and relaxing proving and shaping and baking. Plus, your house is filled with the best smell on earth. Is there anything like the smell of baking bread? That alone is guaranteed to make you happy. This week I baked cinnamon rolls. I wasn't in any particular need of baking therapy but I do have a new cookbook full of delicious sounding recipes and I finally had time to try it out. 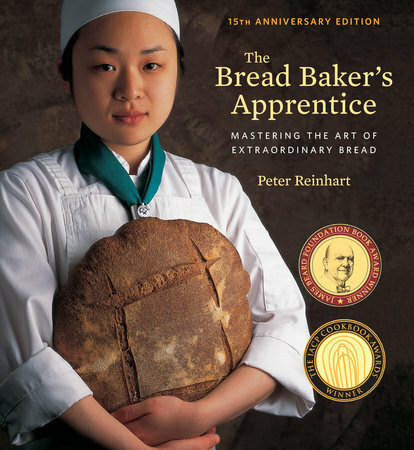 The cookbook is The Bread Baker's Apprentice* by Peter Reinhart. Based on the one recipe I have tried, I absolutely love it. The first 100 or so pages are information about bread. The book covers such things as types of yeast and how fermentation works, bakers formulas (which I haven't quite gotten to grips with) and shaping loaves. It is more technical than many cookbooks I have used but still manages to be accessible and easy to understand. The recipes themselves are also clearly written. Each step is easy to follow. However, the proof is in the pudding, or in this case, the proof is in the cinnamon rolls. How did they turn out? Well, my family managed to eat half the pan within half an hour of them coming out of the oven and my son told me that they are the best thing I have ever baked. And as I think I have made clear, I bake a lot. I call that a success. Now to decide what I will try next. Maybe home made English Muffins or the Cranberry Walnut Celebration Bread. So many choices. So much therapy ahead of me. So much delicious bread. I have not had good luck baking bread. But I bake for stress as well, and I usually take the sweet stuff into work, because it's just me at home. So people at work are sometimes happy when I get stressed out. Yes, I tend to give some of it away too. We don't need that many sweets in the house! Bread can be a bit tricky to learn but once you know how the dough is supposed to look and act it is actually very adaptable. Lisa, I've found that my bread dough rises best if I stick it in my (cold) oven with a pan of boiling water, turn on the oven light, and close the door. That provides just enough extra heat to get it to rise nicely. My sister-in-law clued me in to that trick, and it's made a big difference. I was not brave enough to try baking "real" bread from scratch until I was in my 30s, I think because my mom never baked bread except the frozen dough kind, so I thought it was unattainable. But my best friend started baking bread from scratch and convinced me to try it, and I baked 5 loaves yesterday for lunch for everyone who was here for Thanksgiving. It's a joy! Even when my oven misbehaves like it has this week. I'd been baking fruit breads and sweet breads for many years, though. I baked two loaves of apple bread yesterday too that came out so delicious. They were from one of my favorite cookbooks, An Unexpected Cookbook by Chris-Rachael Oseland (I reviewed it last year). In fact, we made 4 other recipes from that cookbook yesterday too, to switch up our Thanksgiving feast a bit -- still had a turkey, other people brought cranberry sauce and sweet potatoes and Irish potatoes, but our other sides were different, which turned out so fun. Apple bread sounds delicious. I'll have to read you post on the cookbook. My mom baked bread all the time when I was little. I loved it, the process, the smell, the taste. It is just such a comforting thing. You can make the cinnamon rolls the day ahead. Get them to the stage where they are shaped and ready for their second rise. Put them in the fridge overnight. Just take them out in the morning. The only drawback is they have to be out early enough to warm up and then rise. Maybe three hours? But three hours still would mean getting up at 5:30 to get it out if we're going to eat breakfast at 8:30 :-b Still, something to think about -- thanks. I find it to be a very good stress reliever. Of course, I bake when I am happy too. I probably just bake too much. I went through a phase where I was reading tons of bread books, and Peter Reinhardt's (this one and the whole grain baking one) were so interesting but they eventually made me feel paralyzed with all the technical detail. I wanted to forget about all those niggly little steps and just bake. But if the recipes work for you, that's great! He has so much brilliant information. I found the technical details interesting but I am not sure it is information that will ever find practical application in my baking. What worked for me was that the one recipe I have made so far was so very simple to follow and turned out so beautifully. Even some things that intimidate me, like bagels, didn't look that overwhelming. I'll see what I think as I try more of his recipes. I find my baking hobby deeply therapeutic as well. It’s the best way to ease into a Saturday or spend lazy Sundays. I shy away from breads, though. Too many failures! My biggest issue is how my dough consistently refuse to rise. Mostly I stick with brownies, cakes, cookies. Baking bread is an exercise in patience. The process can seem overwhelming at first but once you have the basics down it is simple and satisfying. Dough that refuses to rise, hmmm. Make sure that the liquid you add is not too hot. That can kill your yeast. Also, be patient. Weather can impact the dough. Also, sometimes it just takes more time than the recipe says. If you try the cinnamon rolls be sure to let me know how they turn out.